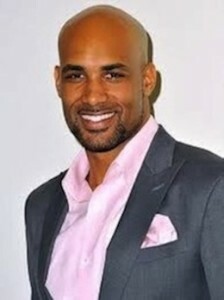 Boris Kodjoe, was born in Vienna, Austria, to Ursula Kodjoe, a psychologist from Germany, and Eric Kodjoe, a physician from Ghana, West Africa. He grew up in Germany with brother Patrick and sister Nadja, where he went to school and where his parents exposed him to athletics and the arts early in his life. He became one of the best Tennis players in the country and was amongst the top ten junior players in the world when a severe back injury cut his professional Tennis career short. In the fall of 1992 he decided to accept a Tennis scholarship to Virginia Commonwealth University in Richmond. While studying in Richmond, he was approached by an agent of the Ford Modeling agency in New York, but went on to earn his marketing degree in May of 1996. In June he joined Ford in New York and his career skyrocketed immediately when he booked twelve campaigns such as Ralph Lauren, Perry Ellis, Yves Saint Laurent, the GAP, within the first seven months. He worked with photographers like Bruce Weber, Herb Ritts, Mathew Rolston, and Marco Glaviano for all the major publications, such as Vogue, GQ, and Esquire, making him one of the few recognizable faces amongst male Supermodels. Boris’ impressive track record was awarded with a Supermodel Award at the Fall ’98 fashion shows. Hollywood soon took notice in Boris. While studying with acting coach Janet Alhanti, he started guest starring on such sitcoms as “Steve Harvey” and “For Your Love”, and he was featured in the Spike Lee produced feature film “Love and Basketball”, starring Omar Epps and Sanaa Lathan. In April 2004, Boris starred in the Sony/Screen Gems produced “Hard Time. He then produced and starred, alongside Nicole Parker, in the Paramount/UPN pilot “Second Time Around”. A project the couple developed with Paramount and writer/producer Ralph Farquar. On March 5th of this year, Boris and Nicole welcomed their 1st child, Sophie Tei-Naaki Lee Kodjoe, to this world. Sophie weighed in at 8 pounds, 2 ounces, and measured 22 inches in height. The happy couple went on to get married in Boris&#65533; hometown in Germany, on May 21st. Boris has received three NAACP Award Nominations for ‘Outstanding supporting actor in a drama’, and one for ‘Outstanding supporting actor in a feature. “Soul Food” the series continues to be one of TV’s biggest hits, raking in record-breaking ratings even in syndication, and winning three NAACP Awards for best drama. Boris’ main personal interest is to encourage young people to value their education and strive for their own individual goals. He feels blessed and fortunate, and believes he has a certain responsibility to share his views and experiences with others, i.e. motivate them to reach for their stars.